Light, fluffy and delicious, these pancakes put a twist on an American classic. 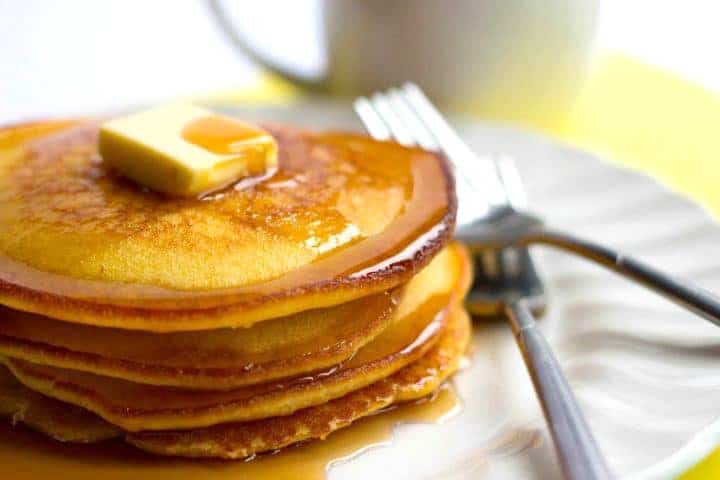 Serve them stacked high with syrup and butter. 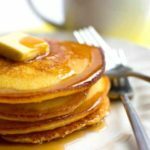 This easy recipe for Cornbread Breakfast Pancakes makes crisp, fluffy pancakes from scratch that come out perfect every time. Don’t you just love cornbread? I love it so much I’ve created six different cornbread recipes based on it – each with its own cornbread twist. To name a few – I’ve made Corn Muffins, Mini Cornbread Loaves, Blueberry Cornbread Muffins, Strawberry & Honey Cornbread Muffins. I have to say that they came out so much better than I had ever imagined! They came out deliciously crispy on the outside and light and fluffy on the inside. Making pancakes isn’t always easy. I’ve made many a pancake that was cooked on the outside, but raw or chewy in the middle. With a lot of time and practice, I’ve found the perfect way to make perfect pancakes every time. 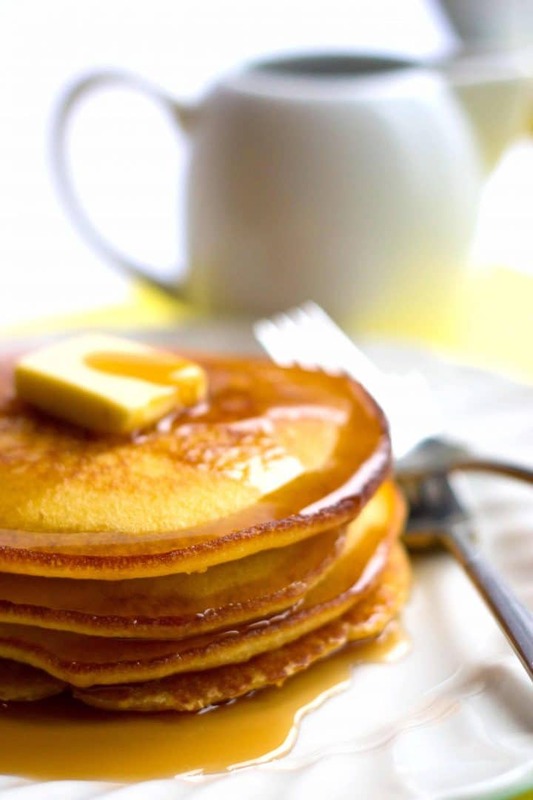 Whether you’re making cornbread pancakes or buttermilk pancakes, these tips will work for you. An electric griddle or frying pan makes cooking pancakes super easy. If you’re new to making pancakes, I highly recommend using one as it’s easy to tell your pan is at the right temperature. Heat your pan to 375°F. Your electric pans usually have some indicator that lets you know when it reaches the correct temperature. For stovetop pans, preheat it over medium heat. A good test is to add a drop of water to the pan. If it dances around the pan, it’s the correct temperature. If it doesn’t move, the pan is too cold, and if it sizzles and evaporates, the pan is too hot. Start with pouring a little oil or clarified butter to the pan. About a teaspoon will do. Wipe the oil around with a pastry brush or paper towel until the whole pan is lightly coated. Using a measuring cup, pour a quarter cup of batter into the pan as many times as you can without having the pancakes touch. If they run into each other – don’t worry all is not lost. Just wait until they cook enough and you can separate them with your spatula before flipping. When your pancakes form bubbles, you’ll know it’s time to flip when the bubbles have mostly popped and the edges look fluffy and cooked. 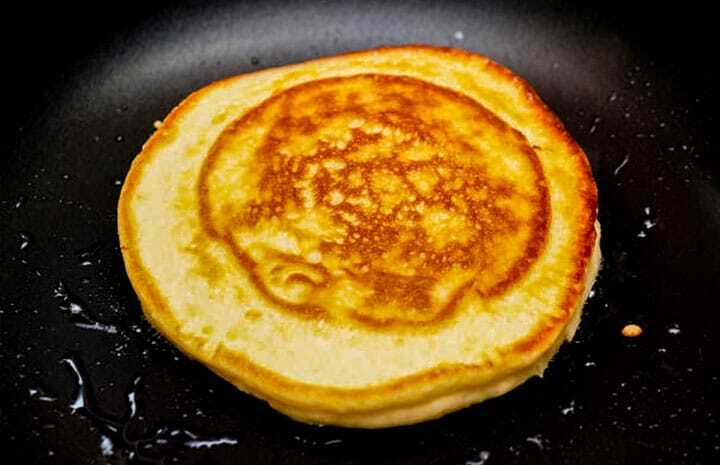 Flip the pancakes with a spatula and then cook the other side another 1 – 2 minutes. You can keep the pancakes warm in the oven while you continue cooking or serve as you go. Now that the pan is good and hot, you might want to lower the heat for the next batch to avoid burning. 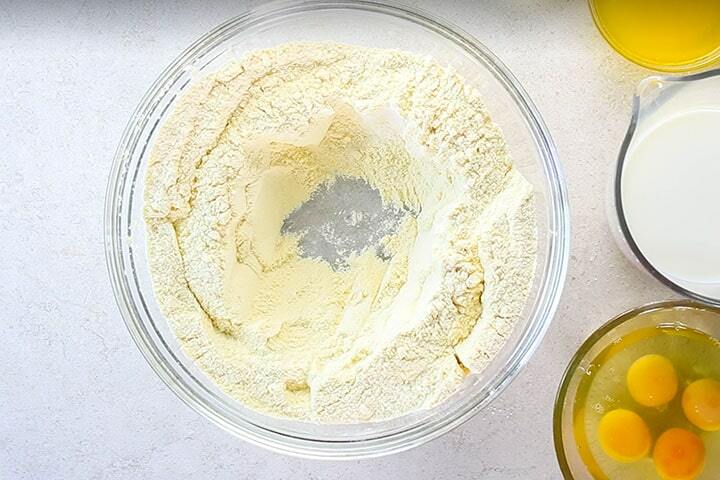 Mix egg, milk, melted butter, and oil in a large mixing bowl. Pour into the well of dry ingredients. Preheat it over medium heat. Test to make sure it’s heated properly and then pour 1⁄4 cup batter on the pan at a time to form the pancakes. 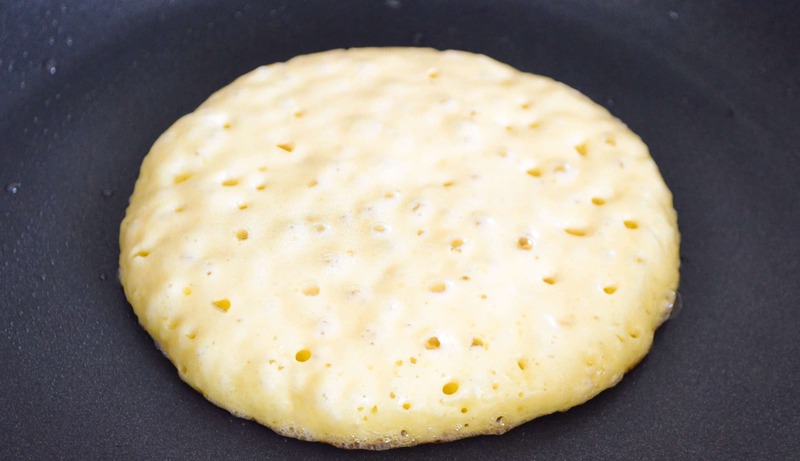 Cook bubbles form over the top of the pancake and begin to pop. Flip and cook until browned on the other side (1-2 minutes). Continue with remaining batter. 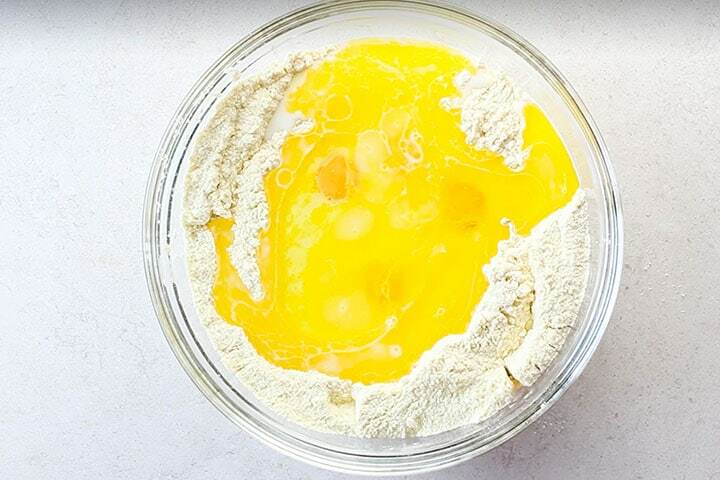 To make pancakes that are light and fluffy, separate the eggs and beat the egg whites until they form a soft peak. Then gently fold them into the batter after all the other ingredients are mixed together. Always preheat the pan and do a test with a small amount of batter. This will ensure you have the correct temperature and the pancakes crisp on the outside and the inside gets fully cooked. Use clarified butter (or ghee) to grease the pan. 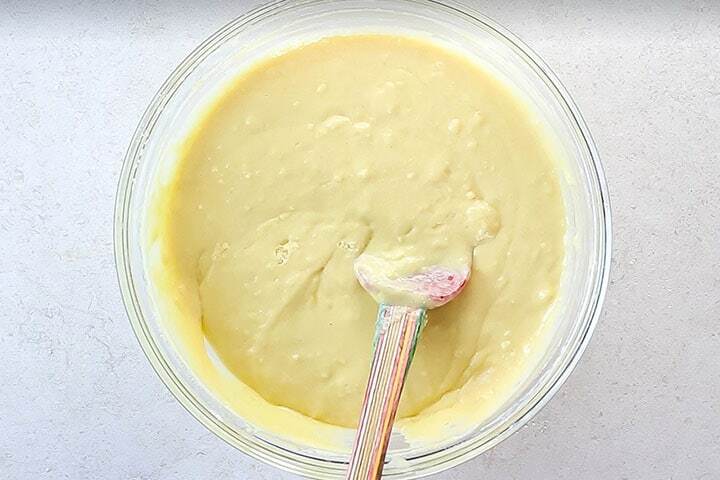 Clarified butter can cook at high heat without burning and not only makes the pancakes crispy but adds a buttery flavor too. Preheat the pan over medium heat. Pour a little oil or clarified butter to the pan (About a teaspoon). Wipe the oil around the pan with a pastry brush or paper towel until coated. Using a measuring cup, pour a quarter cup of batter into the pan as many times as you can without having the pancakes touch. When your pancakes form popped bubbles, and the edges look fluffy and cooked, flip and cook another 1-2 minutes. Continue with remaining batter. Lower the heat for the second batch to avoid burning. You can keep the pancakes warm in the oven while you continue cooking or serve as you go. An electric griddle or frying pan makes cooking pancakes super easy. If you’re new to making pancakes, I highly recommend using one as it’s easy to tell your pan is at the right temperature. Heat your pan to 375°F. Your electric pans usually have some indicator that lets you know when it reaches the correct temperature. Just tried these today. Absolutely delicious! Light and fluffy in the inside with crisp edges. Great tasting. Will be making them again. Yum-oh! I halved the recipe and got 6 pancakes. Thank you so much, Margie, for your lovely feedback, It is so nice to hear! Wonderful flavor! I am pleased! I am also glad you included the nutritional info because i was about to do a breakdown. One question though, it does not indicate how much is a serving exactly.. can you inform? Hi Kimmy, Thank you I am glad you like! My nutritional breakdown is per pancake and the whole recipe serves 10 pancakes, I hope this answers your question! Beautiful pancakes. I have experimented with great variety of flours but never added cornmeal to my pancake batter. Great idea! As a boy growing up in the ’40’s my mother would always make pancakes for our Sunday morning breakfast. She’d make two kinds; buckwheat cakes and corn cakes. This recipe comes about as close as you can get to Mom’s corn pancakes. You can even refrigerate the leftover pancakes and have cornbread with later meals. Just pop a cold one in the toaster and add a little butter when they are hot. VG! Wow Whit, what a wonderful comment! I’m so glad I can come close to your mom’s recipe. It’s truly an honor! Tried these this morning. Delicious alternative to traditional pancakes. LOVE the taste of a cornmeal muffin. Thanks! When I was a little girl my grandma would make something like these. She called them Hoe Cakes and we would have gravy with them at supper. I have tried making these unsuccessfully in the past. I look forward to trying this! Hi Tracy, Thanks so much for sharing. I love hearing stories of food and childhood memories. 🙂 Hope you like these! How many cakes is one serving? I think I got about 14 or 16 cakes out of the whole batch using 1/4 cup scoop. These are the best pancakes btw! I don’t even think they need butter and syrup. I ate them dry! Super delish. Erren, they look beautiful!! They’re a fave in our household and have been a family staple for generations (minus the wheat flour and using corn flour only), but we call them Johnny Cakes. Hi Michele, You learn something new every day! I really never heard of anything like it before I made them, but then again before moving away and going without, I never knew I loved cornbread so much so I wasn’t exactly seeking it out. I was afraid to make them with just cornmeal because I thought they might turn out too dry. I’ll have to try it some time! Hi Erren, making these again!! So good and I am super craving them today.